THRACE, Kingdom of, Lysimachos, (323-281 B.C. 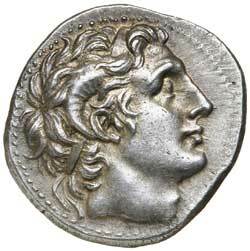 ), silver drachm, 18mm, (4.34 g), Ephesos mint, struck c.295/4-289/8 B.C., obv. diademed head of the deified Alexander right, with horn of Ammon, rev. 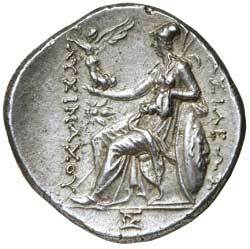 **[B]ASILEWS LUSIMAXOU*, on right and left sides, Athena Nikephoros seated to left, her left arm resting on shield, transverse spear in background, bee to inner left, monogram in exergue, (S.6817, cf.Thompson 165 and 166 [stater and tetradrachm with same controls], Triton V, lot 1336 var. [same obv. die, monogram on throne], Sunrise 167 [this coin]). Extremely fine, lightly toned, slight die shift and very rare. Ex Dr V.J.A. Flynn Collection and CNG Triton Auction XVIII Sale, 5 January 2015 (lot 3), with ticket, coming from the Sunrise Collection.